Years later, Natale Forni told Stone he wondered if the cause might have been spontaneous combustion, as earlier that day workmen had been rubbing down the interior woodwork and there was “turpentine-saturated waste.” Since a solvent like turpentine is used on finished wood only in combination with other things such as linseed oil, it’s presumed he meant there were oily rags lying around. And when a 1995 team of forensic experts looked at the Wolf House fire they concluded that yep, it was spontaneous combustion, all right. Not everyone agrees with that. Jonah Raskin (local author of “The Radical Jack London” and other books) was told by an SSU anthropologist it’s an example of “hollywooding” – neatly wrapping up the mystery by making scapegoats of the nameless workers and letting everyone else off the hook.5 And as I explained in “TIME TO REOPEN THE JACK LONDON FIRE INVESTIGATION,” data in the 1995 study supporting that spontaneous combustion theory is clearly wrong, making the matter far from settled. To be fair, it has to be acknowledged the fire could have been caused by burning rags – only not in the very specific way claimed in that investigation. “Eliza” was Eliza Shepard, one of Jack London’s stepsisters. She was his business manager, the superintendent of his ranch and construction boss of the Wolf House project. Jack depended upon her utterly – as he had for much of his life. She and her 13 year-old son lived near Jack’s cottage in a little house he built for them (and likewise mortgaged shortly before the fire). They had arrived on the ranch in 1910 after she separated from her husband, Captain James H. Shepard. What happend that day in May, 1913, is unclear. Both the Press Democrat and Argus-Courier stated James lived on the ranch, but it is more likely he was there to visit his son who was seriously injured in an electrical accident a few weeks earlier. Also involved in the incident was Eliza’s sister, Ida and her husband Jack Byrne, who lived in Glen Ellen. Self-serving, yes, but what’s striking about her telling is that she went considerably out of the way to avoid identifying the “old man” as Jack’s brother-in-law (none of the newspapers mentioned the family connection either). Charmian was emotionally close to Eliza and dependent upon her her managerial skills as much as Jack was, so she was presumably shielding Eliza and her son, Irving. Eliza London was roughly eight years older than Jack and from his earliest days was a combination playmate and surrogate mother. When she was sixteen she married a man who was lodging with their family and moved away. Her husband was 41 and brought with him a family of three, the youngest still an infant. His name was James H. Shepard. Little is known about his personal life except he was born in Bergen, New Jersey in 1843. The name of his first wife is a mystery, as is what became of her. 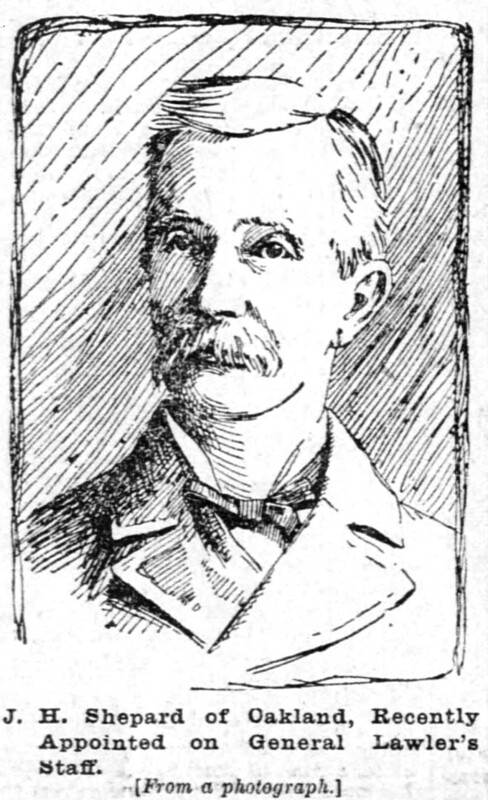 A profile of him appeared in an 1895 San Francisco Call which shows he was a Captain during the Civil War, posted at the San Francisco Presidio and Fort Yuma, where he was nearly fatally wounded in the southwest Indian wars. After that he spent nearly twenty years at the surgeon-general’s office in Washington, D.C. He returned to California in 1884 and almost immediately met and married Eliza. Besides having three kids and a teenage wife he also had lots of bills, and legal notices appeared in the papers stating he was insolvent. Shepard became a veteran’s pension attorney, which is to say he helped old soldiers or their widows obtain the federal pensions for military service which was their due. It was also considered the most sleazy aspect of the legal profession. The government paid $25 to a pension attorney for every awarded claim – and in an era when a skilled workman was lucky to get 25¢ an hour, that was sweet money. The Commissioner of Pensions estimated there were 50,000 pension attorneys beating bushes nationwide looking for potential applicants. In 1887 a widow in Texas who had never applied for a pension was awarded one for a husband who supposedly fought in the Revolutionary War (take a moment to ponder the number of generation gaps in that relationship). Commissioner Evans asked Congress to abolish the pension attorney system because the pension rolls were filled with fraudulent claims. “The ordinary pension attorney is worse than the most pestiferous varmint that ever invaded a hen roost,” he said. The San Francisco Call felt compelled to explain “varmint” was not libelous because Evans came from Tennessee, where a jury would not consider it derogatory to the reputation of the person accused. By all accounts Captain Shepard was the rare good guy, advertising in the newspapers as “J. H. Shepard & Co. The Old Reliable Attorneys.” He was a high-ranking officer in the regional G. A. R. (Grand Army of the Republic – the organization of Civil War and Mexican War veterans) and was apparently the whistleblower exposing graft and fraud at the veteran’s home in Yountville, then operated by a private association. He lobbied the state legislature to eliminate a fee on claim forms (and won) and testified in one court case where he had worked for nine years to have a Civil War claim approved. Eliza joined the office as a notary public and herself became a lifelong advocate for veterans, national president of the American Legion Auxiliary 1925-1926. Jack remained close with Eliza and in the sphere of the Shepard clan. James’ son Hubert, three years older than Jack, got him a laundry job in 1897. That summer Jack decided to join the Klondike Gold Rush and the Shepard home in Oakland was mortgaged to finance his grubstake, with one condition: James insisted he tag along. James was then 54 and not in the best health. James reportedly had a mild heart attack just before their ship left for its eight-day voyage to Alaska, making the older man more of a burden than equitable partner. Onboard they formed a party with three other prospectors to share equipment. Once home, James faded. The only notable event in his life during the following dozen years was the 1899 birth of Irving (Washington Irving Shepard, actually) his only child with Eliza. The pension attorney advertisements stopped in 1901. He was mentioned briefly in 1904 for having his son-in-law arrested for abandoning his wife. In 1909 he offered himself as a longshot candidate to lead the national G. A. R. Meanwhile, Eliza’s star was in ascendance. She often appeared in the legal notices for buying and selling property around Oakland as well as her many activities as a leader of the local Women’s Relief Corps, which was the G. A. R. auxiliary. When she took Irving and moved to Glen Ellen in 1910 she wasn’t just turning away from a failed marriage – she was leaving a social network which meant everything to her. Start with motive: Shepard blamed Jack for his wife leaving him, according to their grandson. But he was also sour on Eliza – in 1915 he sued for divorce charging she had deserted him. According to the FBI profile of “personal retaliation” arsonists (see part one), fire locations are meaningful, specifically chosen to show it was an act of vengeance. Jack and his sister had everything invested, both financially and emotionally, in the completion of Wolf House. Opportunity: Shepard was at the ranch that very day and arguing with Jack, according to author Irving Stone. The FBI says this type of arsonist is opportunistic – he walks to the fire scene, rarely breaks in, and starts the blaze using materials already there. Wolf House was then completely open (even the windows were not installed), unguarded and Natale Forni was probably right that workmen had stuff lying around. Capability: Shepard’s grandson said he wanted to kill London in that gun-waving incident a few months earlier and Dunn points to another incident in his past: At an 1896 G. A. R. convention, Shepard angrily said to an opponent, “if you say anything about my character that you cannot prove I’ll make you bite the dust.” That may read like corny cowboy dialogue today, but in context of the era it was very clear he was making a death threat. But these were examples of dramatic emotional behavior, not violence – he didn’t draw a gun on the guy in 1896 and if he was determined to shoot Jack he could have attempted that; instead, the gun fired only while Eliza was trying to wrestle it away. These episodes demonstrate, however, that he wanted to make a show of pushing back hard when he felt his honor had been wronged – and that’s significant. Capt. Shepard’s last hurrah came in 1916 when he revived his pension advertisement (for a single day!) in the Oakland Tribune. He had been divorced from Eliza for a year with her retaining all the property; he now sued claiming some of it had been bought with his money. As ownership was settled in the divorce, the case was thrown out. He died in 1917 a fairly poor man, with a little over $2,000 and no possessions to speak of. There is no proof James Shepard set the Wolf House fire, but there is no better suspect; if it was arson it was almost certainly by his hand. What I think happened is this: Late that night he walked into the building, still stewing over the earlier argument with Jack London. I doubt he had pre-meditated plans. Perhaps he saw a bucket with sawdust, wood scraps or even oily rags; perhaps he dropped in a cigarette; perhaps he thought he’d be getting even with his unloving wife and her unsympathetic brother by causing them headaches with a little fire. It would cause some damage, sure, scorch the woodwork, stink up the place, and maybe set back the completion date, but it certainly wouldn’t take down the whole building. Not a big magnificent house like that. 3 Raskin, Jonah; “Burning Down the House.” The story was told to Gaye LeBaron by William Forni, whose father heard the argument while playing in the house the month of the fire. BELOW: Ruins of Wolf House viewed from the other side, probably 1914-1917, when the surrounding redwood trees were cut down. Photo: California Parks Dept. Jack London, the famous novelist, and John J. Burns of San Francisco, a bookkeeper for the Southern Pacific Company, were arrested Monday morning on warrants issued by Justice of the Peace Atchison, charging them with assault and battery. The complaint was sworn io by J. H. Shepard, who lives on the London place at Glen Ellen. A cash bail of $5O was deposited in each case and the matter set for trial next Monday morning. Mr. Shepard states that there was trouble between his wife and her sister in which the sister upbraided the wife. He claims that Burns was present and did not take Mrs. Shepard’s part. Burns was invited to the Shepard home, but Shepard decided that he could not be admitted. When Burns came to the house Shepard, who had a pistol in his side pocket, went to the door and ordered him away. Mrs. Shepard came out during the trouble and found that her husband was abusing Burns. Fearing that he would draw his gun she took it out of his pocket. Her husband then attempted to get it away from her and Burns interfered. In the tussle that ensued the weapon was discharged twice. Mrs. Shepard retained the gun after the trouble between Burns and Shepard; she then appealed to London, whose home is not far away. When London came he sided with Burns and this so angered Shepard that he again tried to wrest the gun from his wife. Both Burns and London then interfered and Shepard claims that Burns grasped him by the wrists and held him while London choked him. At the conclusion ot the cross examination of the third witness in the case against Jack London and John Burns in Judge Atchison’s court Monday afternoon District Attorney Clarence Lea moved to dismiss the charge as the evidence did not warrant a conviction in his opinion. The charge was assault and battery and was preferred by J. W. Shepard after a quarrel in which London and Burns were called upon to interfere. The evidence showed that Shepard was armed and had made threats against Burns and that in grappling with his wife the weapon was discharged twice the trigger being pulled by Shepard. Mrs. Shepard stated that her husband was striking her with one hand while grasping the weapon with the other and that she called upon Burns to help her which he did. London had been summoned and he jerked the gun out ot Shepard’s hand. The interior of Jack London’s nearly completed new home on his ranch near Glen Ellen, was gutted by a fire that started shortly before midnight and which was still burning at 1 o’clock this morning. At that hour the fire was reported to have spread to the wooded hillside and the canyon beyond the new home. A man employed on the London ranch told a Press Democrat representative over the long-distance telephone this morning that the origin of the fire was unknown. At the time he was ’phoning from the old house at present occupied by Mr. and Mrs. London, he said the novelist and his wife were at the scene of the fire. 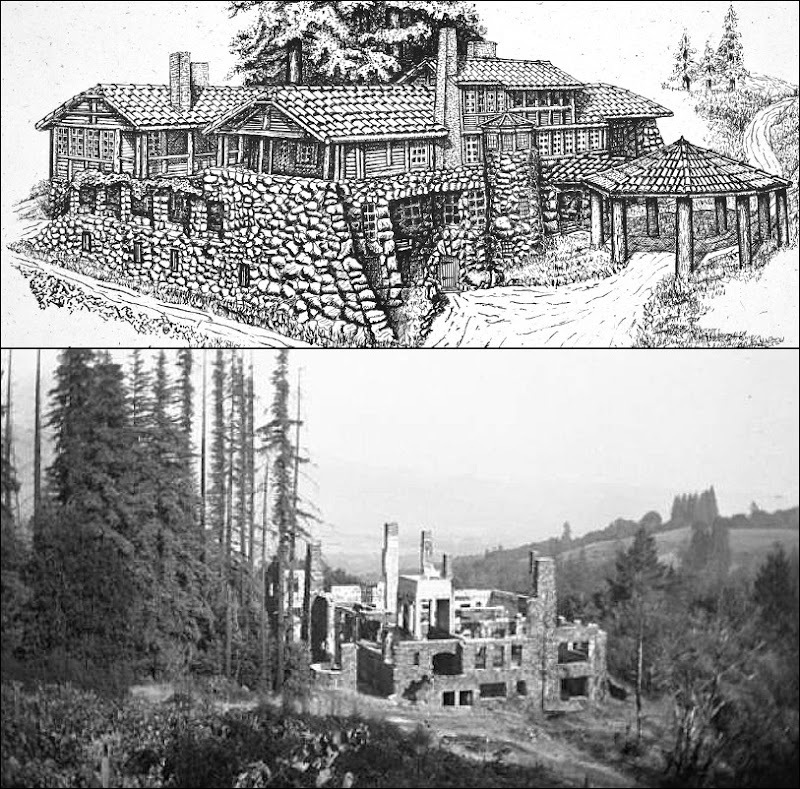 The magnificent stone castle on the hillside which Jack London has been building for a long time was nearing completion and the damage done by the fire, of course, was necessarily confined to the expensive woodwork and finish that has been installed, not damaging the walls. The house was to have been ready for occupancy in the fall and a large force of men have been employed on the place. A telephone message to The Press Democrat from Sonoma this morning also confirmed the news that it was the new London home which the fire destroyed. A fire would do considerable damage to the scenery and wooded hillsides and canyons if it spread to any extent. At 2:30 this morning, Q. R. Wickham. of the Sonoma State Home, telephoned that he had just returned from the scene of the fire and that the entire building had been gutted, leaving nothing but the masonry standing. The fire did not spread to the timber owing to the prompt action of guards on the place when the fire was discovered. Mr. Wickham said he talked with Mr. and Mrs, Jack London, who had been on the place up to 6 o’clock, and the foreman, who left at 8 o’clock, and none of them had the least idea how the fire originated. The loss will be very heavy. The spirit of Jack London is not depressed by a fire, even if the flames do devastate the interior of a majestic castle he has been building for a couple of years on the hillside on his big ranch near Glen Ellen, occupying the most romantic spot in all the country round. The author of “The Sea Wolf” and other thrilling stories, decreed Saturday that the work of reconstruction of the castle shall commence immediately after the Insurance adjuster has inspected the premises. Be it known that Mr. London had $10,000 insurance on the castle, In three companies represented by Luther W. Burris of this city. His loss however, will be between $35,000 and $40,000, according to the estimate furnished on Saturday. As stated Saturday morning in The Press Democrat’s account of the fire, the walls of the castle are still standing, but the interior of the building is gutted. The roof of red tile, which had just been completed, cost $6,000. The marble work, hewn and carved by the experts in that line, until its finish excelled anything like it in this state. This is where the great loss comes in, in addition to the magnificent oak and walnut and the other wood furnishings. As to the origin of the fire, it may have been the work of a discharged employee and it may not. Anyhow, it is still a mystery and when the red glow leaped from the turrets of the castle on Friday night shortly before midnight, it surprised everybody who saw it, and particularly surprised Mr. and Mrs. London, who were aroused from their slumbers in their old home some distance away with the news that the castle was burning. It was hard for people here and elsewhere to realize how a fire could do so much damage in a massive stone building and to glance up now it seems harder to imagine with the stout walls and the turreted sides still standing. There are many people taking a peep at the standing walls of Jack London’s castle near Glen Ellen, the scene of the Friday night fire. A large number of people took a drive down to Glen Ellen for the purpose and not a few city residents motored up from the different resorts to take a look at the ravages wrought by the flames upon the interior of what was rapidly assuming shape as one of the finest country homes in the State or in the West. The insurance adjusters went out to the place on Monday to inspect the premises. London will get ail of the $10,000 called for in the policy as the loss is complete and only the walls of the building remain. L. W. Burris, fire insurance agent of this city and H. M. Farrar, loss adjuster, visited the scene of the Jack London fire Tuesday. It was only a formal viewing of the remains as the flames of early Saturday morning left nothing except bare walls to view. There is a strong belief that the disaster was not accidental, but no clew has been extracted from the mystery. Mr. London will begin rebuilding at once. He was working on his last story, a sea yarn, the color of which he gathered in his recent voyage around Cape Horn, and he finished the last chapters two days after his rare house burned down. Such an interesting read, looking forward to The Secret Life of Mrs. London and all that history and intrigue. Just speculation, but the ranch borders with the Sonoma State Home for the feeble-minded. While most of the ‘inmates’ as the Home were harmless, it did house several arsonists at one time. Several fires occurred at the Home.